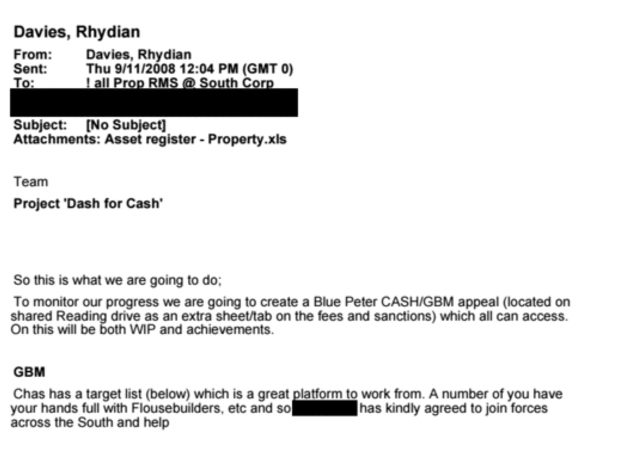 Essentially the email by Rhydian Davies, who was a regional director at RBS and now works at HSBC, is a naked stated to relationship managers to move as many businesses as they could in to GRG, move all loans to LIBOR and to impose fees on customers. The GRG wish list was called the Blue Peter Appeal. Of all of the GRG related materials that have been made public, this has to be the most unfortunate email that RBS has lost. Dash For Cash is what you would have expected in regards to the bonuses (in line with the equally infamous Grab A Grand bonuses offered. What it does do, however, is prove that RBS and its senior directors had absolutely no consideration for its customers. It only cared about scalping customers and bleeding them dry. Some did not make it, but others did. The only reason that RBS made it was the balance sheet that would have made Britain a bankrupt state if RBS had been allowed to collapse. The only way RBS could survive was to smash customers and bleed them dry – hence the Blue Peter Appeal sheets and the request to “Dash For Cash”. It is also as astonishing that in September 2011 the FSA wrote to RBS and confirmed that GRG was “fit for purpose”. This is astonishing. By September 2011 businesses were becoming very vocal about how unlawful GRG appeared to be. There is no wonder that the FCA has been hoping to keep its s. 166 report into GRG under wraps. Businesses need evidence of wrong doing to issue proceedings. They are now at or past limitation. Despite this, the FCA has allowed this report to be kicked into the long grass with no likely time for it to be released. Well, today’s document dump makes that almost a moot point. These documents show some quite astonishing things. The Dash For Cash email and likely many other documents will allow RBS GRG customers to evidence their claims. If you wish to discuss how to evidence your claim, please contact Muldoon Britton urgently.